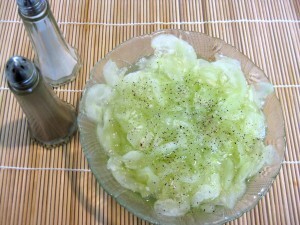 Cucumber salad (uhorkový šalát) is a frequent companion to Slovak dishes. You will find it taking place next to baked chicken or pork schnitzel. It’s also one of those “too simple to be true” foods. Here is the how-to-guide for two servings. 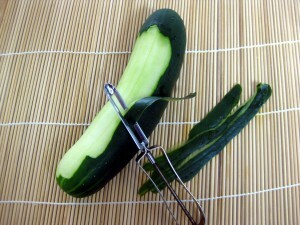 Start by peeling the cucumber (uhorka). Slice it into thin slices using a box grater and place in a salad bowl. Then add a teaspoon of salt and half a clove of garlic (strúčik cesnaku), minced. Then add sugar and vinegar, to taste. Or if you don’t like it too “vinegary”, mix the vinegar with water, so that you have enough liquid for the cucumbers to swim in. I ended up using two tablespoons of sugar and no water. Top off with black pepper and let sit for few minutes to allow the flavors mix through. Enjoy! Wow, sour cream? I have never tried that. Does it turn the juice milky? I don’t do sour cream. I do it pretty much the same way you do, though I add onion and slat and then I mix all other ingredients (vinegar, water, sugar, minced garlic)and than I add it to salad it over the cucumber. Luboš, v slovenskej verzii uhorkového šalátu nie je smotana. Čo je to tu popisované, to je varianta gréckeho šalátu caciky a ten sa robí s jogurtom. I remember ordering it in Slovakia and being surprised that there was no sour cream. Nowadays I use yoghurt instead. We also often add some finely chopped onion. My Familys recipe is similar but without the vinegar, slice cucumbers and a sweet onion as thin as you can, mix in enough water and sour cream so they float, salt and pepper to taste!! My version handed down to me by my Grandfather is a little different with respect to ingredients. It uses some diced green peppers, sliced green onions and a dash of paprika in the mix…no garlic. Never tried it with sour cream before, but I have heard of it. The interesting thing is, is that this salad pairs so well with Chicken Paprikash which does have sour cream in the sauce. When I saw this I got so exited…my grandma (Bohemian) made this with just sliced (however you like) but added about 1-2 tbs of mayo, garlic salt and pepper and let it sit so that it did have a milky sauce (thin)…keep these great ones coming! I make them in the morning and they are good for supper that night. I put in glass container with top and turn throughout the day to marinate. You can add scallions if you want. My mother came from Spacince a town outside of Ternava. 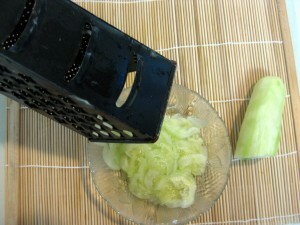 She sliced the cucumbers thin in a bowl then salted and put in refrigerator for 2 hours and as long as over night. About 1 hour before she was ready to serve, drained the water,sliced some onion (thinly). 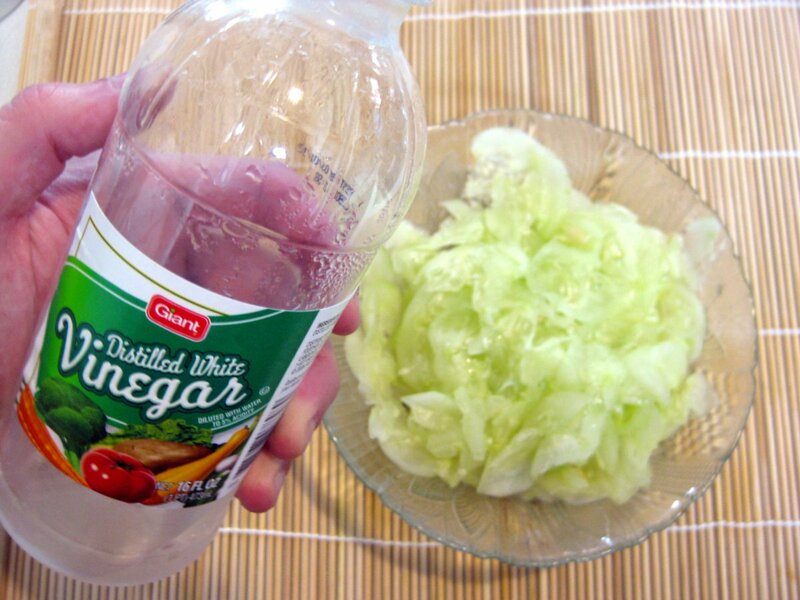 In a cup mixed 1 spoon of vinager to 2 spoons of sugar and mixed it with the cucumbers and onion. When she used sour cream she sliced the cucumbers thicker, salted them a littleand let them sit for about 1 hour in refridgerator. when ready to serve drained water. in a cup mixed sour cream with a few drops of vinager and mixed into the cuicumbers. I assume you meant Trnava. That is the town I am from. My dad always makes the salad during summer. First he peels and slices the cucumbers puts salt on them, waits a while a squeezes the juice, then adds sugar, paprika, blackpepper, vinegar and garlic to it. He likes it like that plain, but I prefer adding a teaspoon of sourcream to my portion. As for your questions regarding capsicum, yes that is an “Australian” term to describe what people in America call “Bell Peppers” lol. I don’t understand why they have different names for essentially the same thing! Slice it very thin, 1 small onion chopped very fine,fresh parsley(5-8 straws), place it in serving bowl.Now make vinagarette:about 1 1/2cup water, add about 5-7TBS of white vinegar, add 2-3TBS of sugar, salt to taste,about 1/2Tea spoon black ground pepper.You can add more or less of each ingredient as your taste require. Bring all vinegarette’s ingriedents to boil and leave it to cool off.Mix it with cucumber mix when ready to serve. Fresh and crisp. Oh,fresh parsley needs to be chopped as well! We use sour cream and fresh dill! Oh I do love this salad. P..s. I am 1/2 Polish 1/2 Slovak. Maternal grandparents from Poloma, (Hiznay). Fraternal (Jarosz) from Tarnow. So glad I found this site. in india we prepare something similar with small onions.onions are peeled and mixed with paprika and vinegar. also veggies like cucumber,tomato and onion are chopped finely and mixed in yogurt which is beaten well with a dash of chilli,cumin and salt. We have always eaten this, so delicious! We also make one version with out the vinegar & sugar and substitute it with milk and season with salt and pepper. And u cant go over board on the salt and pepper, it will blend nicely. the trick is to let it stand 4-8 or more hours and let it soak up all the flavors. And when u r done with the cucumbers, drink the milk! It’s awesome!!! We always have cucumbers and sour cream as one of the many side dishes for Thanksgiving. Slice cucumbers fairly thick, lay on towel and let some moisture wick out also pat them with another towel to help wick the tops. Mix sour cream, onion, vinegar, and a dash of sugar, then let it sit to marry the flavors. Toss the cucumbers with the sour cream mixture and season to taste. This is great when the sour cream mixture from the cucumbers is drizzled on the sage dressing….Having it again in a couple days. We also use it as a dipping sauce for left over turkey that is snatched from the fridge later that night. My grandparents always added sourcream too. I have a hard time geting the proportins right. I keep trying!! Nuz ,kazda rada dobra nad zlato.Ja mam uhorky nadovsetko rada a najviac sa stotoznujem s Ludmilou.Kedze moja mama ho mala rada so smotanou a potom mala zlcnikovy problem,tak ja som si nasla inu metodu.Postruhane uhorky nasolim a necham postat, az kym nepustia stavu aj ked ho robim na hocijaky sposob.Medzi tym si pripravim pretlaceny cesnak,nasekany kopor,zeleny petrzlen,zelenu cibulku.Uhorky zo stavy zasadne vzdy vyzmykam a potom pridam stipku cervenej,mletej papriky,spominane dochutiny a bud pouzijem octovy nalev(uz spominany Ludmilou)alebo namiesto smotany,pouzivam jogurt,ale naposledy mi velmi zachutil KEFIR.Ked nie je v kazdom obchode dostupny,tak ho nahradi Buttermilk.Ak v mojom salate nie je nasekany cestvy kopor,tak to nie je ono.Cez leto si pridam viac kefiru a mam to ako studenu polievku.A potom,ze Slovaci nie su vynaliezavi.Ved len obycajny,a tak dobry uhorkovy salat sme tu predviedli v mnohych variaciach. I made this following your recipe and my Slovak wife really liked it and has even asked me to make it again. I put it in the refrigerator for a little while before serving to chill it. we use lemon juice instead of vinegar mixed woth water salt pepper and sugar and we used sliced onions also, sometimes we put in cream or sour cream. we also use this juice on grated carrots. My Slovak grandma made this so often when I was growing up. I always loved it and made it for my family tonight. It was just as delicious as I remember. I love Slovakia its people its food its everything – In Lada near Presov the best city in Slovakia – not many gypos unlike Kosice – this is my favourite salad and parene buchty to follow with chocolate in the centre instead of jam – yum yum big filled tum!!! Toto je jednoznacne ten najhnusnejsi uhorkovy salat aky existuje a veru nie som ani zdaleka jediny, kto si to o tomto type salatu mysli. Milujem uhorky, ale tento salat je daka zbastardena leniva verzia, ktora nemala uzriet svetlo sveta. 20 rokov cestujem po celom svete (predcasny dochodok) a narazil som na tento salat iba na Slovensku (v CR som kupodivu nikdy nebol), v Rumunsku, Bulharsku a raz aj v Rusku. Zena aj napriek mojim vyhradam zvykla tento salat robit, ale pocas cestovania sama sa naucila, ze to skoro nikomu zahranicnemu nechutilo (iba jednemu.. zo 100 asi) – ludom stacil jediny “bite” a stacilo (a to ho zvykla robievat presne ako zvysok slovakov, ani prilis kysly, sladky ci slany). Slovenska kuchyna je dreck. this was really “tasteful” critique of Slovak cuisine, if it was not soo wrong. Dear Peter, it looks like your “world travel” was rather limited, and so is your taste for what is good or bad. I can assure you that I’ve traveled to more places around the world, some of them you don’t even know that they exist, yet, “uhorkovy salat” was well received across the world. Now, thank you very much for your distasteful contribution to this site. I make mine much like yours, except that instead of the vinegar I will sometimes put in a teaspoon of the juice from my delicious Polish pickle jar! My Slovak grandma used to make this, minus the garlic. It made her kitchen smell wonderful. She also prepared iceberg lettuce this way. Looking for the warm potato cucumber recipe with vinegar. My mom used to make it. Krompirja morcia? I do very similar, however use kosher salt, dill weed, rice wine vinegar and sliced thin cucumbers and put in frig till quite cold.